On July 12, 2016, a league game was scheduled. Kamal Sadiq was a member of the soccer league and was also a parttime worker at the YMCA. He was assigned to serve as the scorekeeper during the game. Since the league had privately rented the field, Sadiq didn’t think that he needed to check out one of the five automated external defibrillator devices that the YMCA had for the game. Jabo was participating in the soccer game. When Sadiq had left the field to go to the bathroom, Jabo left the field and walked towards the bleachers, where he went into a sudden cardiac arrest. Jabo fell and hit his head on the bleachers. Other league members administered first aid and called 911. League members began administering cardiopulmonary resuscitation to Jabo after being instructed to do so by the 911 operator. When Sadiq came back to the field, Jabo had already gone into cardiac arrest and was receiving CPR. The other league members said that Sadiq was involved in helping Jabo, and Sadiq directed the ambulance to the correct entrance of the field. Sadiq did not call the front desk to tell them what was happening despite the fact that he was required to report emergency situations and there was an AED at the front desk. Jabo was transported to the hospital and died after he arrived. The family filed a wrongful death lawsuit against the YMCA, alleging that it was required to bring an AED to the game and its failure to do so contributed to Jabo’s death. 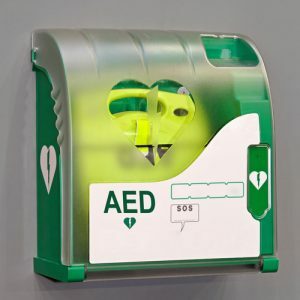 Issue: Whether a health facility has a duty to provide and use AEDs when nonmember adults who are using the facilities under a private contract go into cardiac arrest? In the trial court, the plaintiffs argued that the YMCA’s policy was to bring AED devices to its own YMCA-sponsored games and that it abandoned that policy by failing to bring an AED to the Chaldean league soccer game. The YMCA argued that it didn’t qualify as a health studio in its relationship to the soccer league’s rental of its field since the league did not agree to abide by the YMCA’s policies and terms. The YMCA filed a motion for summary judgment, arguing that it was not a health studio for purposes of the AED statute and that the plaintiff’s claim of ordinary negligence must fail as a matter of law. The trial court ruled for the YMCA and granted the motion for summary judgment, and the plaintiffs filed an appeal. Rule: Health studios must acquire and maintain AEDs and train their staff on their use, and a health studio is a facility that allows people or groups to use the facility for physical exercise on a membership basis. Under Cal. Civ. Code § 104113, health studios in California are required to purchase and maintain AEDs and to train their staff on how to use them. Health studios are defined as facilities that let people or groups use their facilities for physical exercise on a membership basis. While health studios are not medical facilities, the state has determined that the potential risks of people suffering cardiac arrests while they are on site necessitate the AED requirements. When courts interpret the meaning of statutes, they must do so while keeping in mind what the intent of the legislature was when the statutes were written. The YMCA asked the court to take judicial notice of an analysis that was completed by the Senate Judiciary staff of the AED act during the 2005 to 2006 legislative session. The court agreed to take judicial notice of it and looked to the analysis for help with determining the legislative intent for what a covered health studio is. According to the analysis, a health studio under the act was not intended to include a public or private owner of a building that rents the facility to a third party to use for recreational purposes. The court agreed that the YMCA acts as a health studio in relation to its own members and also found that it wasn’t disputed that the YMCA had five AEDs that it had acquired and maintained. However, the court stated that the plaintiff-appellants were unable to show that there was a membership relationship between the league members and the YMCA as required by the statute. The only relationship that the plaintiffs were able to show between the league members and the YMCA was that they signed releases of liability that the court had found were unenforceable. The program director of the YMCA had testified that the agreement between the YMCA and the league was for a private rental. The league had negotiated a special agreement that the YMCA would only assign a staff person to unlock and lock the field and would supply soccer balls and scorekeeping equipment because the league wanted to keep its membership exclusive. The court next looked at the AED requirements. In Verdugo v. Target Corp., 59 Cal.4th 312 (2014), the California Supreme Court stated that the legislature is in the best position to make public policy considerations when it is enacting a law that imposes a duty. Extending a duty to cover more parties that were not contemplated by the legislature is generally not done. Finally, the court noted the attenuated nature of the relationship between Jabo as a member of the league and the YMCA. The court found that the YMCA was not a health studio in relationship to Jabo and the other league members as was contemplated by the AED statute. The relationship that existed was a nonmember relationship and was too attenuated to impose a duty. As a result, the court upheld the trial court’s grant of the motion for summary judgment. Understanding the duties that different facilities might have to provide emergency services can be difficult. People who have lost loved ones because of a failure to render aid at a facility might want to talk to an experienced personal injury attorney who can analyze the facts under the relevant statutes and cases. Contact the Law Offices of Steven M. Sweat to schedule a confidential case analysis so that you can learn more about your potential claim.